This project is no longer funded and will not be updated. After bursting to life with 300-meter (1,000-foot) tall lava fountains in November 2011, the eruption of Central Africa’s Nyamuragira Volcano continued into the new year. This satellite image shows the volcano on the morning of Jan. 3, 2012. In the natural color image an active lava flow snakes to the northeast, while the central vent and a volcanic plume rich in sulfur dioxide are also visible. According to volcanologist Erik Klemetti of the Eruptions blog, the orange color and narrow trace of the flow suggest that it is open to the air, unlike flows on Kilauea, which are usually carried through lava tubes. Older flows and undisturbed forest are also visible. This image was acquired by the Advanced Land Imager (ALI) aboard the Earth Observing-1 (EO-1) satellite. GORISK. (2011, Dec. 7). November 2011 eruption. Retrieved Jan. 4, 2011. Klemetti, E. (2011, Nov. 7). New fissure eruption at the Congo’s Nyamuragira. Retrieved Jan. 4, 2011. Virunga National Park. (2011, Dec. 6). Last week in Virunga: 28 Nov–4 Dec 2011. Retrieved Jan. 4, 2011. Virunga National Park. (2011, Nov. 7). Nyamulagira Volcano erupts! Retrieved Jan. 4, 2011. Nyamuragira: Index of Monthly Reports. Global Volcanism Program. Observing Volcanoes, Satellite Thinks for Itself. NASA Earth Observatory. NASA Earth Observatory image by Jesse Allen and Robert Simmon, using ALI data from the EO-1 Team. 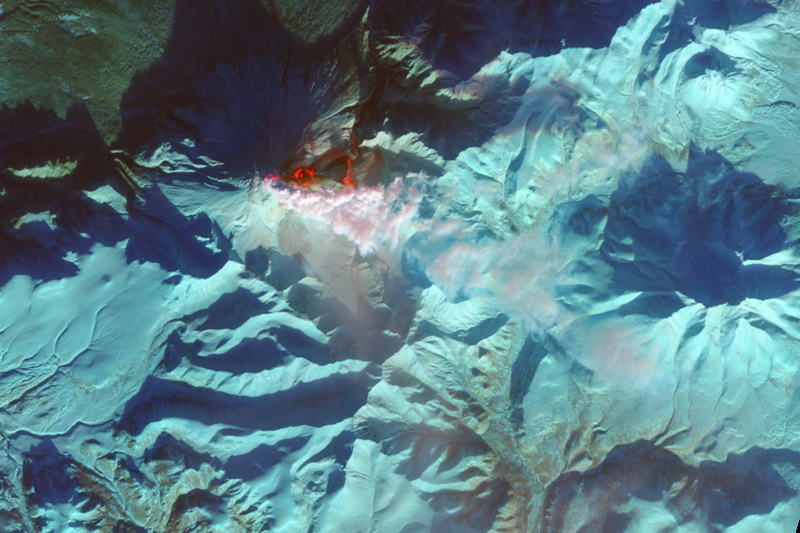 This false-color image shows the summit of Nyamuragira and nearby Nyiragongo Volcano. The heat of the active lava flow causes it to glow in shortwave and near-infrared light, giving a bright red-orange appearance. A lava lake within the summit crater of Nyiragongo is also glowing. On Dec. 30, 2011, Kizimen Volcano emitted a steam plume that condensed rapidly in the frigid winter air of Russia’s Kamchatka Peninsula. Kizimen began erupting in November 2010, when a fissure opened on the volcano’s southeast flank. In January 2011 a thick lava flow began to descend from the summit toward the east. This flow is still active, and heat sources along the margins of the flow are visible in infrared imagery. Much of the top of the flow is cool enough to allow snow to accumulate on the surface. As the flow grows, volcanic material spills into a stream valley north of the volcano, covering the valley floor with dark debris. This natural color image was acquired by the Advanced Land Imager (ALI) aboard the Earth Observing-1 (EO-1) satellite. White snow covers most of the landscape, with a dusting of brown ash downwind (southeast) of Kizimen’s summit. To the northeast, a fumarole emits a white gas plume. North-facing slopes in the region are in deep shadow because the sun is low on the horizon in early winter. Global Volcanism Program. (2011, January). Powerful fissure eruption in November 2010 ends ~82-year repose. Retrieved Jan. 3, 2012. Kamchatka Volcanic Eruption Response Team. (2011, Dec. 29). KVERT information releases. Retrieved Jan. 3, 2012. NASA image by Jesse Allen and Robert Simmon, using ALI data from the EO-1 Team. Check out this volcano interactive by clicking on this link: http://dsc.discovery.com/convergence/pompeii/interactive/interactive.html. Sources: U.S. Geological Survey: Nancy Riggs, associate professor, Department of Geology at Northern Arizona University. © 2004 Discovery Communications Inc. Copyright © 2012 Discovery Communications LLC. Check out this volcano interactive by clicking on this link: http://www.channelone.com/news/specials/disaster/swf_volcano/. 1 Channel One News: http://www.channelone.com/. Turrialba is the easternmost of Costa Rica’s active volcanoes. A series of small explosive eruptions began there in January 2010, the first substantial activity at Turrialba since the 1860s. The 2010 explosions were presaged by the opening of small gas vents (fumaroles) beginning in 2006. A new vent, located on the southeastern flank of the volcano’s West Crater, opened on Jan. 12, 2012. According to the Observatorio Vulcanológico y Sismológico de Costa Rica, the new vent exhibited “a vigorous output of bluish gas at high temperature (T > 592°C) that generated a jet-like sound audible from the visitor lookout.” Activity since 2010 had been confined to a larger vent on the southwest flank of the West Crater, which continues to be the major source of emissions. This image was acquired on Jan. 21, 2012, by the Advanced Spaceborne Thermal Reflection and Emission Radiometer (ASTER) aboard NASA’s Terra satellite. The false-color image is a combination of near infrared, red, and green light. Healthy vegetation is bright red, while vegetation damaged by years of acidic gas emissions is brown. Bare ground in the summit craters is brown or gray. The rock is very weak at the summit of Turrialba because of the intense rains of the region and the persistent hydrothermal activity at the summit. This means that new vents can open at the summit when pressure in the conduit is high enough to make its way through the weakened rock. The activity of January 12 was a pressure release at the summit through the hydrothermally altered “rotten rock,” not a magmatic or phreatic (steam-driven) eruption. Global Volcanism Program. (2012, Jan. 18). Turrialba. Retrieved Jan. 25, 2012. Klemetti, E. (2012, Jan. 5). Turrialba in Costa Rica erupts and a close view at Poas. Observatorio Vulcanológico y Sismológico de Costa Rica. (2012, Jan. 18). Turrialba Volcano (Costa Rica): Opening of a new fumarolic vent on the southeast flank of the West Crater on Jan. 12th, 2012. Retrieved Jan. 25, 2012. NASA Earth Observatory image by Jesse Allen and Robert Simmon, using data from the NASA/GSFC/METI/ERSDAC/JAROS and U.S./Japan ASTER Science Team. Caption by Erik Klemetti (Denison University and the Eruptions blog) and Robert Simmon. At 3,680 meters and 3,715 meters above sea level, respectively, the Payún Matru and Payún Liso stratovolcanoes are the highest points of the Payún Matru volcanic field of West Central Argentina. This astronaut photograph illustrates some of the striking geological features of the field, which is approximately 140 kilometers east of the Andes mountain chain. The summit of Payún Matru is dominated by a roughly 15-kilometer wide caldera (image center), formed by an explosive eruption approximately 168,000 years ago. Several dark lava flows, erupted from smaller vents and fissures, are visible in the northwestern part of the field. One distinct flow, erupted from Volcan Santa María (northwest of Payún Matru), is approximately 15 kilometers long. A number of small cinder cones—appearing as brown dots because of the short lens used—are built on older lava flows (grey) to the northeast. While there is no recorded observation of the most recent volcanic activity, oral histories suggest that eruptions were witnessed by indigenous peoples. Most Andean volcanoes and earthquakes follow the trend of the greater Andes mountain chain and are aligned roughly north-south above the tectonic boundary between the subducting (descending) Nazca Plate and the overriding South American Plate, as predicted by plate tectonic theory. Volcanic centers that are located some distance from the major trend—such as Payún Matru—typically result from more complex geological processes and can provide additional insight into the subduction process. This image, an astronaut photograph ISS030-E-30265, was acquired on Dec. 31, 2011, with a Nikon D2Xs digital camera using a 70 mm lens, and is provided by the ISS Crew Earth Observations experiment and Image Science and Analysis Laboratory at Johnson Space Center. The image was taken by the Expedition 30 crew. The image has been cropped and enhanced to improve contrast, and lens artifacts have been removed. The International Space Station Program supports the laboratory as part of the ISS National Lab to help astronauts take pictures of Earth that will be of the greatest value to scientists and the public and to make those images freely available on the Internet. Additional images taken by astronauts and cosmonauts can be viewed at the NASA/JSC Gateway to Astronaut Photography of Earth. Caption by William L. Stefanov, Jacobs Technology/ESCG at NASA-JSC. Instrument: ISS - digital camera. Sulfur dioxide concentration over the Sierra Negra Volcano, Galapagos Islands, during an eruption in October 2005. From Oct. 23-Nov. 1, 2005, measured by the Ozone Monitoring Instrument (OMI) on NASA’s Aura satellite. Solar radiation graph 1958-2008, showing how radiation is reduced after major volcanic eruptions. Mauna Loa Observatory atmospheric transmission. Reduced solar radiation because of volcanic aerosols labeled. 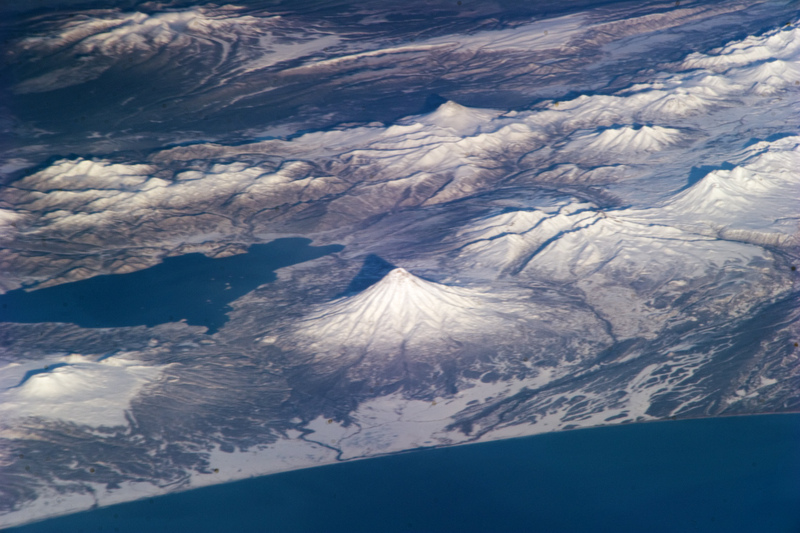 Kamchatka volcanoes are featured in this image photographed by an Expedition 25 crew member on the International Space Station (ISS) on Nov. 19, 2010. This striking photograph features several snow-covered volcanoes located on the Kamchatka Peninsula of the Russian Federation, as seen from the orbital perspective of the ISS. This image also illustrates one of the unique attributes provided by the ISS: the ability to view Earth landscapes at an angle, rather than the "straight down" view typical of many orbital satellite-based sensors. The annotations on this slide highlight the locations of the stratovolcanoes, shield volcano, and overlapping stratovolcanoes on Russia's Kamcharka Peninsula. These volcanoes are identified by Dr. Charles A. Wood. Annotations placed by ETE-GCC team Jan. 25, 2013. The June 12, 1991 eruption column from Mount Pinatubo taken from the east side of Clark Air Base. Compiled From: Smithsonian Institution - Global Volcanism Program, 1998, Newhall and Punongbayan (eds. ), Fire and Mud, Eruptions and Lahars of Mount Pinatubo, Philippines: Philippine Institute of Volcanology and Seismology and the University of Washington Press: Mount Pinatubo Location: Philippines. Latitude: 15.13 North Longitude: 120.35 East. Height: 1,745 meters before the June 15, 1991 eruption and 1,485 meters (high point caldera rim) after. Volcano Type: Stratovolcano. U.S. Geological Survey Photograph taken on June 12, 1991, by Dave Harlow. Click on the image below to view full-size.